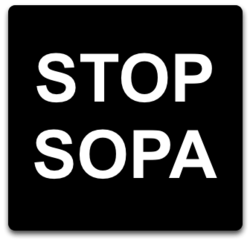 Marketing expert, Charles Gaudet, shares why SOPA shouldn’t have been the lethal injection most entrepreneurs feared most. ...events like SOPA should remind entrepreneurs that depend on the internet for income that they need to begin looking at how many other ways they can grow their business without the dependency on one media or one source of income. On January 19, thousands of protestors celebrated the tentative victory over SOPA helping to ease the concerns that, if SOPA passed, thousands of innocent and legitimate websites could be taken down, with no recourse, no chance for appeal and with a “guilty until proven innocent” mentality due to any foolhardy accusation of a copyright violation. Marketing expert, Charles Gaudet, believes this was a much needed lesson for entrepreneurs that rely too heavily on the Internet for their livelihood. “Countless entrepreneurs feared that if the SOPA legislation passed, they’d be out of business," says Gaudet. "What people don’t realize is that the Internet, by itself, for most people, isn’t a business – it’s simply a source for distributing information. It’s a media. And, anytime you rely on only one media (such as the Internet) as your sole source of generating income, you're opening yourself and your business to becoming vulnerable." Gaudet says that a common threat among small business owners is the dependency on one or two sources of income rather than taking advantage of additional sources either because of a lack of strategic thinking or from getting too comfortable with their current cash-flow. But it’s threats like SOPA and other economic, societal, political, environmental and personal changes that can also effect a business’s cash flow. ABOUT CHARLES GAUDET: Gaudet is widely regarded as a marketing expert for consistently delivering windfalls of profits to his clients by unveiling opportunities that have been previously under-utilized or have gone unnoticed. Gaudet has traveled much of the world studying from business, political and social leaders studying entrepreneurial, marketing and business excellence. He is the founder of PredictableProfits.com and the author of the widely popular blog at http://www.PredictableProfits.com/blog. ABOUT PREDICTABLE PROFITS: Predictable Profits is a leading small business marketing company and a division of Managed Marketing, LLC. The company specializes in finding overlooked marketing opportunities commonly found in most small-to-medium sized businesses and creating actionable marketing strategies for increasing a company’s profits. You can read more about Predictable Profits by visiting the company’s website at http://www.PredictableProfits.com.